Today I was in Oodtshoorn for work, and while visiting all the various restaurants and looking over each wine list, I noticed a wine called Karusa.So in my lunch break I decided to go visit this winery which I didn't know anything about. There is a tasting room and restaurant at the winery. There is a long list of wine to taste. I was allowed to try all the wine, so I did. What I noticed very quickly was that there is a unique taste in all the wines. I was intrigued. I am guessing it is the terroir which was giving these wines this unique flavour. After going through the entire list of wine I bought 6 different wines (Grenache, Muscat Blanc, Red Port, Sauvignon Blanc, Syrah and Shiraz/Cab) and shared them with friends back in the Cape. Everyone I introduced this wine to, liked it and wanted more. I enjoyed the experience I had at Karusa, I liked the wine and would recommend one visits this wine estate when in the area. The lady who was serving me didn't know much about the wine, but it was fine as the wine did all the talking anyway. While at Karusa, I found out there was an olive place just down the road so I headed there afterwards and bought not only olives but pottery also. Be sure to visit this shop before or after you visit Karusa. 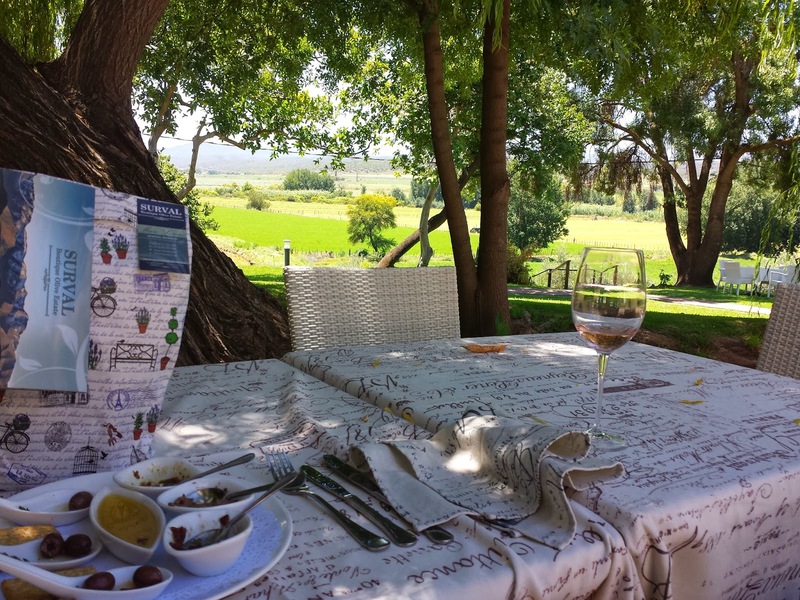 I thoroughly enjoyed Oodtshoorn as a place, there are some true gems for restaurants (Buffelsdrift Game Lodge, Su Casa, and Jemima's to name a few), olives and wine. 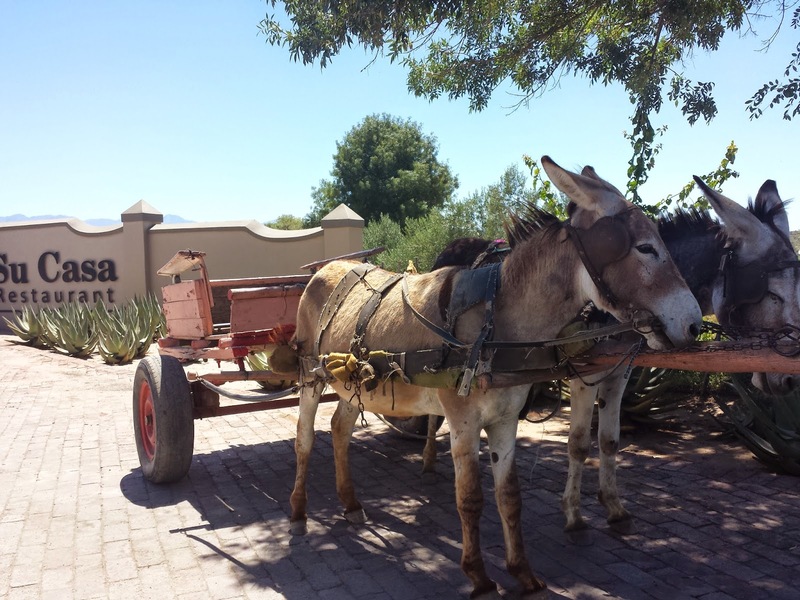 When you plan a trip to Oudtshoorn be sure to go outside of the main city area!! 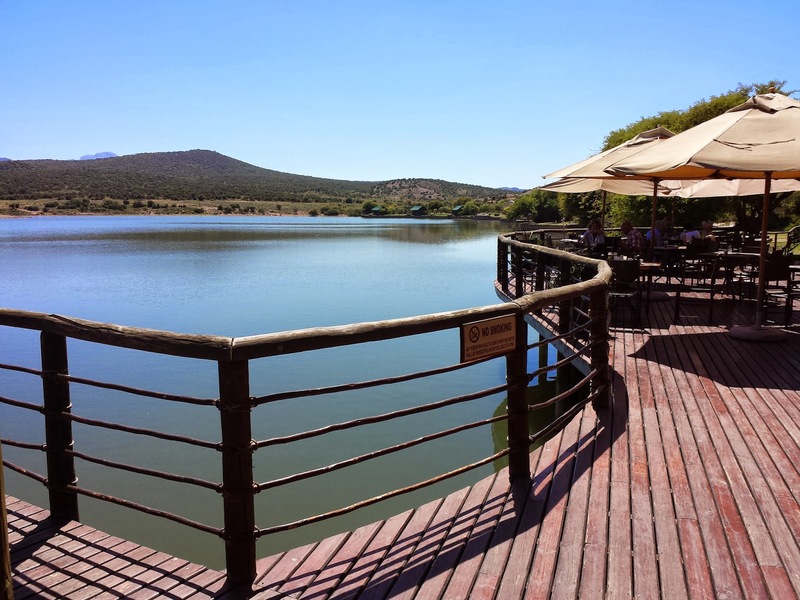 At Buffelsdrift I loved the fact I watched Elephants drink from the water while sitting on the patio enjoying a coffee and at Su Casa I enjoyed an olive platter while enjoying the tranquility of the farm!! I highly recommend visiting both these places!! The 5th Element Syrah/Viognier (95%/5%) 2011 at R145 a bottle had a beautiful smell, was soft, medium bodied, herbs and licorice tones, very earthy!! Earth's Art Chardonnay/Viognier (80%/20%) 2012 at R85 a bottle had aloe vera on the nose, was buttery on the palate, creamy, interesting flavour and a fresh finish. Southern Slope Sauvignon Blanc 2013 at R55 a bottle was green, with hints of capsicum, asparagus, minerality, lime, it was grassy and fresh. Stonerock Viognier 2012 at R55 a bottle had a lovely viognier nose, minerality, was a little sharp. Aloe Ridge Chardonnay - unwooded 2013 at R55 a bottle had good body, interesting flavour, tones of what seemed to be mint and fynbos. One Tree Hill Pinotage 2012 at R78 a bottle had medium body, was dry, tones of berries. This is a unique Pinotage. Terre Noire Syrah 2012 at R78 a bottle was a more serious wine compared to the others. It was smooth but dry. Pepper and dark berry smell, nice palate. The Ancients Pinot Noir 2012 at R78 a bottle was light, soft, had spicy and fynbos tones. Double Black Petite Syrah 2012 at R78 a bottle was very interesting and very dry!! However, the moisture in your mouth comes back quickly. Shiraz Cabernet Sauvignon - wooded 2013 at R55 a bottle. This was smooth, smokey, soft but a little dry on the finish. Grenache Noir/Mouvedre - unwooded 2013 at R40 a bottle was lovely on the nose (tones of almond), spicy and light. Chenin Blanc Sauvignon Blanc 2013 at R45 a bottle had cut grass on the nose and palate, was fresh and crisp. Karusa "Extra Light" - low alc/kilojoule 2013 at R40 a bottle. It was sweet on the nose yet was sour on the palate. Muscat Rose - off dry 2013 at R45 a bottle was sweet on the nose, with a sour/off dry taste. Muscat Blanc - semi sweet 2013 at R45 a bottle has a nice sweet smell and taste, pleasant, little sweet but refreshing. Soleil de Karusa Red Muscadel (375ml) non vintage at R40 a bottle was sweet but not syrupy. Soleil de Karusa Vintage Port (375ml) 2012 at R40 a bottle was very nice, soft, a little sweet, a little spicy, I loved this one!! Soleil de Karusa White Muscadel (375ml) 2013 at R40 a bottle was very sweet, syrupy and honey like. I really hope we will see some Karusa wine in the Cape soon. These wines are really unique and I like that about them!!! Be sure to try this wine when you next see a bottle!! I have visited this winery before for a wine tasting, and I have been there once for lunch and once for dinner on separate occasions but decided to visit again to see if the wines are as I remembered them to be. Briekorp 2012 at R55 a bottle is an unwooded Chardonnay. It was smooth, fruit driven, had tones of apricot, was a little bitter on the finish, with a nice round mouth feel. It had a fresh finish. Berghaan 2012 at R45 a bottle is a Pinotage Rose. It had a lovely ruby red colour, lovely fruity characteristics, was off dry. I believe this wine would be quite a versatile food wine. Tiervoel 2008 at R45 a bottle is a blend of Pinotage and Cabernet Sauvignon (70%/30%). This wine was smooth, light-medium bodied, pleasant easy drinking, berry flavours, light tannins. Muscat D'Alexandrie is a dessert wine at R50 a bottle.This was smooth, medium-full bodied, and it has a little brandy kick to it. I feel that Eaglevlei is producing some very pleasant wines at a great price!! These are in my opinion great value for money wines. Eaglevlei has a nice restaurant, it is affordable and tasty food. They have plenty of seats inside and outside, a great area for children to play and a nice fireplace inside. This is a nice option for those with children.